Prepare yourself to hear new grounds of scorched terrain, as Bestial Mouths premiere the first listen to their upcoming self-titled with “Earth”. The production from Toronto's Egyptrixx (aka David Psutka) conjures the audio descent into a cavern of diamonds, amid menacing synthetic varieties of minor key, black crystal persuasions. 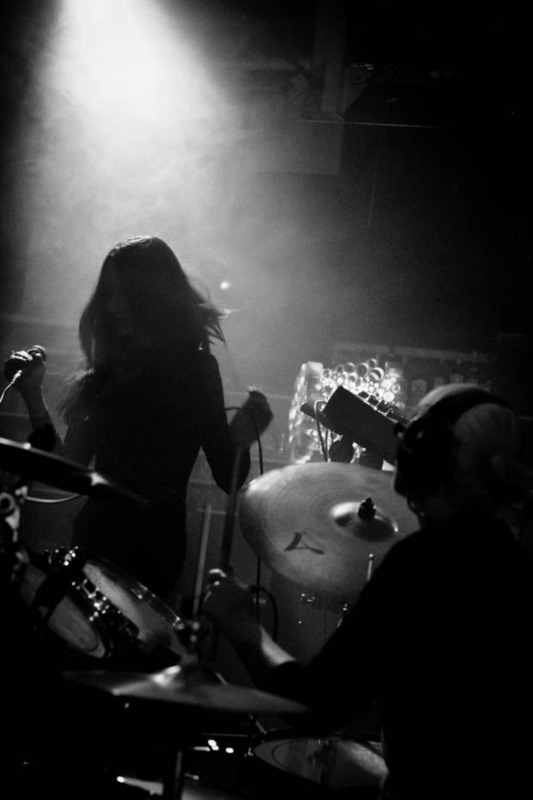 Having already entranced us before with their occultic charms on “White Eyes” and “Hollowed” off the Hissing Veil 12″ from DAIS, their Live at the Echoplex tape from Black Horizons and a 12″ split with Deathday from Desire Records / Sweating Tapes; the terroir of “Earth” is Bestial Mouths at the scariest of their ferocious powers. Let the this journey through northwestern darklands begin with the press of the play button. Chrisopher Myrick and Gustavo Aldana are the keyboard, sample and synth team that begin the song's central drone bloodline. Thunder clasps sampled in a bottle streak across like stadium choruses of impassioned spectators. Enter the commanding incantations of Lynette Cerezo, amid shouts of ritual that instruct the abidance from earthly soil to the axis calibration of planetary alignment. Lynette's range finds a home in a sustain fused to Christopher and Gustavo's development of dark globe atmospheres. But as the angry clasps of lightning occur closer and closer together after 4 minutes deep, percussionist Jessica Reuter steers the track into the oblivion of a new secular perdition. Listen to the Northwest spellbinders as they grab the the controls reigns from the angry councils of gnostic deities. The Bestial Mouths gang of Lynette, Chris, Gustavo, and Jessica talked to us on recording their self-titled with Egyptrixx, the interpretive sonic-sphere of “Earth”, with hints of a forthcoming video. Lynette: We started writing and recording right after we got back from our first tour of Europe and I think we were influenced by that. The artwork from the cover is from a statue that we stayed near in Brussels. It was amazing to be able to work with David, but I was a little bit terrified because i didn’t want to let him down. Of course I got a cold right when we started recording the vocals. Gus: I wanted the drum programming to be really aggressive and bass heavy for this track. The idea for the main kick pattern that it was built from was supposed to have a kind of dark industrial dancehall vibe. Coming from a more club-oriented electronic music background, I really enjoy the idea of combining those elements with harsh noise and industrial sounds. I was actually listening to a lot of Night Slugs and Fade to Mind releases when we were writing that song, so the vocal samples that are chopped into the drum programming, as well as the bells, are a kind of extremely twisted interpretation of the elements I was hearing in those songs. Working with David (Egyptrixx) worked out great and was very exciting for me because I was really into his and his labelmates' sounds when we got in touch with each other. I feel like that raw huge kick combined with the intensity of the drum kit and all of the harsh synth sounds give the song this sense of urgent movement, especially in those moments where the drums sound like a march. We want our music to force people to move on a primal level. Chris: I really wanted the lead synth to have a kind of breathy sitar-like sound. I spent forever obsessing over trying to get it right. Working with David was great, we learned a lot form recording with him. Jessica: This song is one of my favorites to play live; it's incredibly aggressive and tense. It sort of evolved from a slower pace into this whirlpool of energy, pushing and pulling with breathy vocals and primal screams, softer hi-hats and pounding toms. The video reflects the concepts we were working with musically and is a nice visual accompaniment to the track's aura. We love Niko and her work, and were so excited she wanted to work with us again after directing the “White Eyes” video. Lynette: Generally, “Earth” is sort of about injustice, or being forced into into something against your will. I would usually rather leave things open to interpretation rather than making it too obvious. We hope that allows people to form a more personal connection to the music. It was really cool to see how Niko chose to translate that visually when we were working on the video for it. The actual making of the video was pretty grueling. We shot it over a couple of really long days, starting at 3am since the body paint took 4 hours to apply and it was somehow always freezing when they put it on. I had these really long fake fingernails on so everyone had to help me wipe my nose and feed me. Chris: Making a video is always totally weird to me. It's incredible to find out what something you've worked on can trigger in someone else though. It’s usually something totally different from what you would have thought. The self-titled Bestial Mouths LP will be available June 25 from Clan Destine Records.